Plow a deep ditch and keep it filled with water, if larvae are found to be moving towards your field crops from adjacent fields. This will prevent larvae from transferring. They will drown if they try. 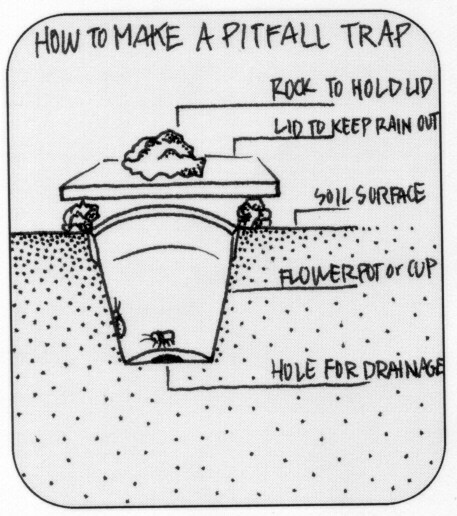 Another method is to dig a deep ditch with vertical sides to trap larvae and prevent them from crawling out. Holes with a diameter of a fence post should be dug every 10 meters apart in the ditch. Larvae will congregate in the deeper holes where they maybe crushed (Scott, 2003). A small piece of plastic, slit to the middle, wrapped around the plant stem and overlapped, can be taped or covered with soil. Another method uses 2 pieces of plastic about 12 inches square, pulled together around the plant from opposite sides and held down with soil (The University of Maine, 2002). Protective collars made of plastic or paper cup, plastic drink bottles with torn-out bottom, sturdy cardboard, and milk cartons. Place the collar around the young plant and push into the soil to prevent the cutworm from attacking the stem. Molasses, saw dusts, or crushed eggshells are place around the base of each plant. When cutworm emerges to feed, it will come in contact with the trap, get stuck, harden, and die. A square of tarpaper (or other heavy, flexible paper) measuring 9-12 cm wide placed at the base of each transplant will prevent adult flies to lay eggs near the plant. Make a cut from the edge to the center making a small hole (in the center). Make sure that the paper will fit around the stem but will lie flat on the ground. During transplanting, place the disc on the soil around each plant so that the stem is in the middle of the disc. Fill half the yellow pan or basin with soapy water. Place the pan close to the plant but expose enough that moth can see it. Trapped moths sink and drown because soap breaks the surface tension of the water.